The global e-commerce market topped US$ 22 trillion last year. Closer to home, India became the 10th-largest market in the world with 22 million buyers generating 20 billion dollars in business through consumer sales. Here in Sri Lanka however, e-commerce remains a nascent sector and a largely urban phenomenon. Fuelled by factors such as the lack of a widespread online presence as well as limited access to personal computers and the high cost of data, consumers prefer traditional bricks-and-mortar stores that offer the reassurance of ‘what you see is what you get’ over the virtual nature of e-commerce. There’s also a lack of trust in paying online. But the reticence of the local market cannot stop the inexorable march of technology. 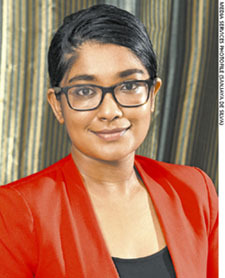 While on the surface it may seem that the country’s e-commerce market is largely dormant, a host of intrepid young entrepreneurs are making it their mission to put Sri Lanka on the global e-commerce map, says Dunilsha Hewage. She reveals that while the e-commerce scene may seem rather lethargic, there’s a solid ‘underground’ network of young entrepreneurs and startups who realise that this is the way forward. And they are working hard to lay the groundwork for a more vibrant online retail culture. “What we would really like to see is the evolution of the online retail sector in its entirety. Many stores that have a presence on social media sites do not offer the authentic online retail experience in terms of payment methods and so on,” she explains. The fashion industry in particular has taken to the concept of online commerce somewhat eagerly. With numerous startups receiving a boost through social media, the industry will in all likelihood be a significant player in improving the country’s online retail presence. Given Sri Lanka’s longstanding relationship with the apparel and fashion industries, it is perhaps fitting that the online sector wants to leverage this relationship to build a visible online retail platform. Her mission, through an online retail space for commercial branded fashion items, is to educate reticent companies and brands on the advantages of online retailing – and encourage them to take the leap. “Sri Lanka has for the past three decades or so been a production hub but this will change. The opportunities offered by free education mean we have an educated and literate workforce,” Hewage asserts. The current lack of infrastructure is a major stumbling block in turning this dream into reality. There’s an urgent need for an overhaul of the entire system. “We have no payment gateway, which is one of the most basic infrastructure requirements for a functioning e-commerce sector. There is no legal protection for consumers and retailers in the online space, nor incentives focussed on entrepreneurs in this arena or a cohesive industry approach towards e-commerce,” Hewage laments. “We have many brilliant minds and so much untapped potential. Many groundbreaking digital products are developed in Sri Lanka but sold abroad because there’s no space, recognition and room to grow in this country. If a fraction of this potential is harnessed locally, it could change the face of e-commerce in the country,” she opines. Despite the challenges, Hewage and other entrepreneurial minds are determined to turn their vision into reality. And she is confident that the efforts of startups and other entrepreneurs like herself will create a dynamic online retail arena. And she hopes that this will fuel the implementation of necessary infrastructure in terms of legal policies, financial services, educational opportunities and physical frameworks, and thus lay the ground for a vibrant e-commerce landscape.